What do you call an electrical machine that cleans floors, rugs or carpets by sucking up dirt or dust in English? It’s called a vacuum cleaner. The other day I dropped a mug on the floor and broke it. I took out a vacuum cleaner and turned it on but it didn’t start running. It’s completely dead. I guess I need to buy a new one right away because we have the big cleaning time coming up before the year ends. Now. Let’s go back to the question at the beginning. 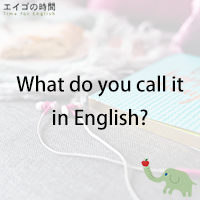 When you want to know how to say something in English, you can point to it and ask “What do you call that in English?” Or you can describe something. For example, what do you call a person who makes cakes and pastries? What do you call a special vehicle that transports sick people to the hospital? What do you call your sister’s daughter in English? Now, why don’t you find answers to these three questions? 1. What do you call a person who makes cakes and pastries? 2. What do you call a special vehicle that transports sick people to the hospital? 3. What do you call your sister’s daughter? Next Post できればやめて。 – I’d rather you didn’t.